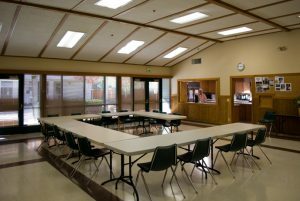 At Danville Congregational Church, we rent several rooms in our facility. These rooms range from large spaces with adjoining kitchens – perfect for a reception, presentation, or dinner – to small group meeting spaces. We can work with you to set up our spaces to your specifications. Please see the Concerts & Recitals page. Our largest social hall is ideal for presentations, receptions, group dinners and events. The 2,400 square feet of carpeted space has a maximum occupancy of 300 in lecture-style seating or 160 seated at tables. Kairos Hall features a professional-level LCD projector with PowerPoint and cinema capabilities, a 12 x 12 screen, and a sound system with wireless microphones and soundboard. Round or rectangular tables are available. The full kitchen, with a Wolf range, double ovens, commercial dishwasher, counter for buffet use, and place settings for up to 100, can be accessed for an additional fee. Other optional services include a setup/teardown service and an AV technician, each for additional fees. 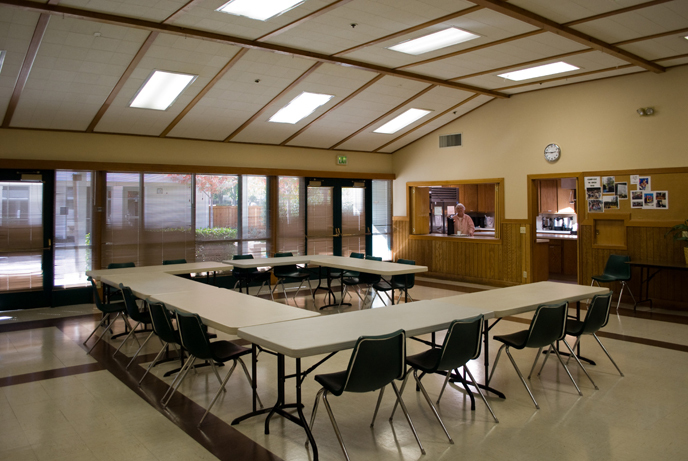 Our smaller-sized social hall is the perfect venue for your small reception or large meeting. It is adjacent to our large patio, providing the option for indoor/outdoor activities. 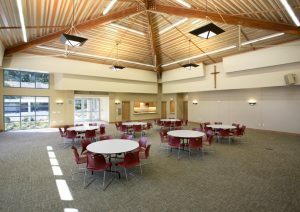 Koinonia Hall is 1,300 square feet and can accommodate up to 80 people for dining or 100 in a lecture format. Tables (rectangular and round) and chairs are available for you to configure for your needs. The adjacent kitchen (optional) is fully stocked with dishes, flatware, cookware, cups and glasses, and features a large cooktop, double oven, coffee maker, dishwasher, and lots of counter space. The Peace Room is 184 square feet, features a large conference table and chairs, and can accommodate up to 10 people. Our Library is 226 square feet and features a small conference table and chairs, and can accommodate a smaller meeting of 8-10. Our Spirit Room measures 286 square feet and can accommodate smaller groups of 12 or fewer people. This room does not have a conference table, but chairs and tables are available to configure for your needs. For rates and more information, please contact the church office at office@danvillechurch.org, or call us at 925-837-6944.